When is it too Windy to Spray? The corn and soybean post-emergence crop protection application season is here. Corn and soybean growers will target post-emergence herbicide applications by the V4 growth stage in soybeans and the four leaf stage in corn to limit yield reductions due to weed competition. Targeting applications by these crop stages will also help ensure applications are made before weeds exceed three to four inches in height, which is the maximum height on many herbicide labels for most effective control. As crops and weeds enter rapid growth stages, wet soil conditions due to recent rains have made it challenging to make timely herbicide applications. As growers rush to complete weed control operations, under very windy conditions, calls about injury resulting from herbicide drift are anticipated. Where fields of Roundup Ready crops are adjacent to non-Roundup Ready crops, it is particularly important to pay attention to the risk of crop injury from pesticide drift. Figure 1. Spray drift during herbicide application. Pesticide drift from the site of application into non-target areas is a violation of Minnesota law governing legal application of pesticides. While there is no state law that dictates restrictions when the wind is blowing at specific wind speeds, applicators must follow all product label directions and precautions which may list specific wind speed restrictions. Always read and follow all product label directions and precautions, appearing on (or included with) the pesticide containers. Some labels have detailed drift minimization requirements for product use. Other labels may only have a broad short statement without details requiring the applicator to prevent drift or not to spray ‘when conditions may result in drift’. Read and follow local, state and federal regulations regarding pesticide application procedures. 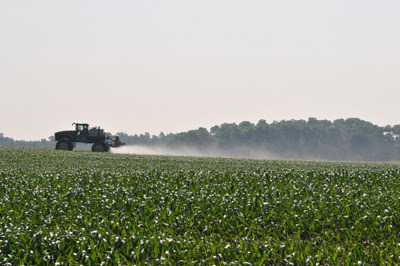 Applicators must know the exact location of the area to be treated, as well as the potential hazard of spray drift or subsequent pesticide movement to surrounding areas. Avoid spray drift. It is illegal to allow spray drift to move off the target site. Drift occurs in two ways, through particle drift and vapor drift. Particle drift occurs when small spray droplets travel long distances during periods of high wind and droplets blow from the targeted site. To avoid this type of drift, use larger spray droplets with low pressure, and apply herbicides only when wind speed is low. Vapor drift occurs when products volatilize or evaporate and move off the application site. The volatility of some products increases as temperatures rise into the upper 80s and 90s. The product label will provide information on when it's not safe to apply the product based on certain temperatures. The highest potential for vapor drift is when conditions are hot and dry. The nozzle directly affects the size of the spray droplet, and droplet size is the major factor influencing herbicide drift. The pesticide label may require use of specific nozzles that produce a coarse- or medium-sized droplet. Coarse droplets reduce drift, resulting in a lower drift potential. Spray boom height should also be considered. The higher the boom, the higher the drift potential. Keep the boom only as high as it needs to be for adequate coverage and sprayer operation. Small droplets take more time to fall to the ground and can thus drift farther. It is desirable to use a nozzle that produces large, uniform droplets. Switching from standard flat-fan nozzles (such as an XR11003) to turbulence-chamber or venturi nozzles increases droplet size and can greatly reduce the amount of drift. Examples of such nozzles are Turbo TeeJet and AIXR TeeJet nozzles (Spraying Systems Co. http://www.teejet.com/ ), Hypro Ultra Lo-Drift and GuardianAir nozzles (http://www.hypropumps.com/ ), and the TurboDrop nozzles (Greenleaf Technologies http://www.greenleaftech.com/). Keep in mind the type of product you are working with when using nozzles that produce larger droplet sizes. Target a coarse-sized droplet for the appropriate pesticides such as a systemic herbicide like glyphosate. The effectiveness of contact herbicides, insecticides, and fungicides can be hindered if applied in a coarse-sized droplet. Lower pressures allow for larger droplet sizes. Be aware that nozzles can produce different droplet sizes at different pressures. So, a nozzle might produce medium droplets at a low pressure but fine droplets at higher pressures. Reducing pressure requires recalibration and adjustments in sprayer speed and carrier volume (gallons per acre). Always measure wind speed and direction before, during, and after the application. Always follow label information, but in general, wind speeds of 3 to 7 mph are preferable. Spray at low wind velocities (less than 10 mph). If wind speed or direction changes during an application, immediately adjust the buffer size or location, or stop the application. Applying pesticides during a temperature inversion can result in damaging, long distance drift. Inversions occur when warm air, which is light, rises upward into the atmosphere and cool air, which is heavy, settles near the ground. When cool air settles below warm air, there is no mixing of the air. Spray droplets are not dispersed, but stay in a concentrated mass that can move off-target with any subtle airflow. Typically, temperature inversions start at dusk and break up with the sunrise because of vertical air mixing. Use caution when spraying at wind speeds less than 3 mph as a temperature inversion could exist. There are many good products on the market for this purpose. However, some are not compatible with certain drift-reducing nozzle types so ask questions of your suppliers. Making pesticide applications is a substantial responsibility with many consequences if not done correctly. Read pesticide labels, check application equipment, and be aware of environmental conditions to reduce drift and make the best use of each product. Decreasing the distance spray droplets travel to reach the target results in less off-target movement. Boom height depends on nozzle angle and spacing. For example, 110° nozzles at 20-inch spacing should be 15 to 18 inches above the target to produce a uniform application rate across the length of the boom. To minimize spray drift potential, maintain a boom height of 24 inches or less above the crop canopy. Consider including buffer zones if sensitive crops are in adjacent fields. Some labels require a 30-foot downwind buffer (in the direction in which the wind is blowing). Other labels recommend a buffer of at least 250 to 300 feet near sensitive areas. Applicators are required to follow the label. Since there are different requirements from label to label, you need to read the individual label to be in compliance. If the buffer is included as part of the production area, treat the buffer with different products that won’t affect the sensitive crop and/or spray that area during a different timeframe to avoid injuring the sensitive crop. Another option is to plant a cover crop in the buffer zone so there won’t be an issue if it’s injured or killed by spray drift. What if Your Crops are Drifted on or You Suspect Drift? Handling human pesticide exposure takes priority over handling pesticide drift. Follow the label for first aid and call the Poison Center at 800/222-1222. For medical emergencies call 911 immediately. Please know that the Minnesota Department of Agriculture does not seek compensation on behalf of parties or entities. They do answer questions, investigate formal complaints, visit sites, review documents and enforce regulations. Report drift complaints as soon as possible as delay may prevent the Minnesota Department of Agriculture to document violations of law. Documentation such as recording dates, collecting information on wind speed and direction, inquiring about the product that was applied, and taking photos of injury can help resolve questions about potential drift issues. The Minnesota Department of Agriculture receives approximately 150 pesticide-related complaints per year. Approximately 66 percent of cases warrant an investigation. Of those, 25 to 30 percent are closed without action because allegations of pesticide drift or misuse could not be substantiated. During 2012 to 2014, about 30 percent of all complaints received related to pesticide drift. A number of these complaints involve lawn care applications in urban settings. Of the total complaints received annually, approximately 40 percent result in financial penalties. For more information, see Spray drift on Extension's weed management website. Minnesota Department of Agriculture 2015. Pesticide Drift Complaint Process and Timeline. https://www.mda.state.mn.us/pesticide-fertilizer/pesticide-drift-complaint-process-and-timeline (verified 5 June 2015). Minnesota Department of Agriculture, St. Paul.